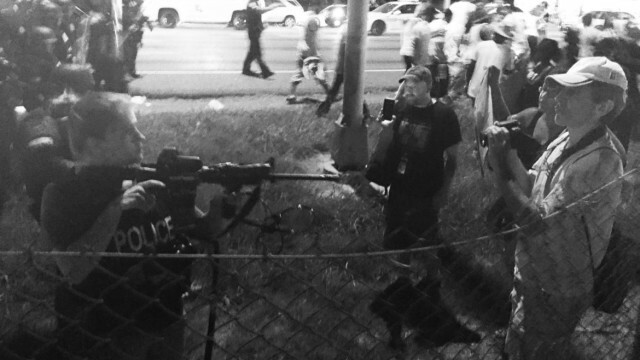 BATON ROUGE, Louisiana — At least one officer aimed an automatic weapon at protesters Saturday night in Baton Rouge as police clad in riot gear advanced on a group marching toward the Interstate-12 onramp. The officer pointed the gun at onlookers, who were mostly teenagers and young adults. Waving the weapon back and forth, the officer yelled, “get back” as several additional officers threw a protester to the ground while making an arrest. Screams of “don’t shoot, don’t shoot” pierced the heavy air. “I feel like the cops are being intimidating in a way and at the same time, they’re looking for a reason to take us out,” said Baton Rouge resident Tyler Jones,16, nodding toward another officer looking down the barrel of a weapon from his perch atop one of several military-style vehicles that rolled by. Protests in Baton Rouge were mostly peaceful, but escalated around 11pm as activists briefly shut down Airline Boulevard and marched toward I-12. The crowds were protesting the death of Alton Sterling, who was shot and killed by Baton Rouge police officers on July 5th. For many teens and young adults, the protest wasn’t just about the anguish of seeing a member of their community killed by police, but about an ongoing distrust of law enforcement and a concern for their future. Read more on Juvenile Justice Information Exchange.